FRAD (Functional Requirements for Authority Data) is a highly theoretical, entity-relationship (E-R) model for authority data. Published in 2009 by the International Federation of Library Associations and Institutions (IFLA), FRAD extends and expands upon the FRBR (Functional Requirements for Bibliographic Records) model, a topic that was featured in a 2012 as a Cataloging Q&A. Find: Find an entity or set of entities corresponding to stated criteria. Contextualize: Place a person, corporate body, work, etc. in context. Authority data users include information professionals who create and maintain authority data (i.e. catalogers) as well as end users of authority information (e.g. librarians, patrons, etc.). Clicking on the authorized title access point for The Girl with the Dragon Tattoo, the catalog would then display the variant Swedish title Män som hatar kvinnor along with “novel” and “2008” listed respectively under the attributes “form of work” and “date of the work” (Jin, p. 104-105). Both FRBR and FRAD provide the foundational structure for RDA (Resource Description and Access) cataloging standards. RDA’s utilization of these two E-R models aid in identifying relationships between a work and its creators as well as a work’s various editions and formats, and is guiding how RDA authorities are being created. This restructuring of data creates the potential of improved collocation and display of catalog information. To achieve this, our integrated library systems (ILS) need to be compliant in establishing and displaying relationships between these various pieces of data. Several institutions have developed fully operational FRBRized systems (e.g. WorldCat.org, UCLA Film and Television Archive OPAC), while others have created experimental systems, algorithms or open source software to allow for FRBR implementation (e.g. OCLC FRBR Work-Set Algorithm, eXtensible Catalog (XC)) (Zhang & Salaba, p. 76-77). 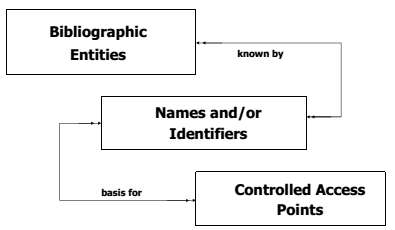 Subject authority data is addressed in Functional Requirements for Subject Authority Data (FRSAD), another E-R model that expands upon the FRBR model. FRSAD will be covered in a future Cataloging Q&A. Barbara: Libraries Unlimited, 2012. Print. Patton, Glenn E., ed. Functional Requirements for Authority Data: A Conceptual Model. Munich: K. G. Saur, 2009. Print. Directions. New York: Neal-Schuman, 2009. Print.